Spring Clean Up is Finally Here! After pruning fertilize with an organic fertilizer such as 100% Organic 6-6-6, Milorganite, Plant-tone or Garden-tone. When applying fertilizer, apply the granular fertilizer between the shrubs. Apply fertilizer in front and in the back of the shrubs. NEVER apply to the base of the shrub or any plant because it will kill your plant. 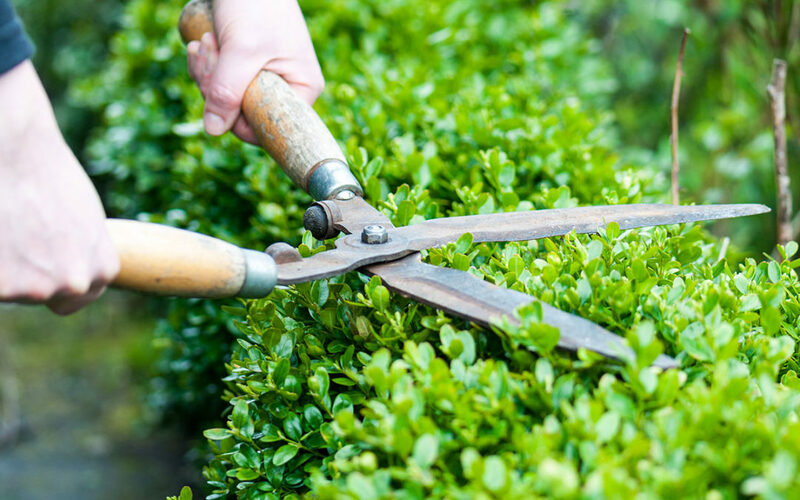 A neglected or overgrown hedge needs severe pruning. If overgrown, prune at least 10-12 inches below desired height and width. Narrow-leaf evergreens, including Junipers or Arborvitae should never be sheared beyond area of existing needles. Better yet, do not formalize these ornamentals. Let them assume a natural shape and selectively hand cut overgrowth. This is the time of year to prepare and replant your annuals or perennials for summer color. Most flowers do best in full sun. For shaded areas use Impatiens, Begonias, and Coleus. For your flowers to blossom well the pH of your soil should be 5.5 to 6.5. Add dolomite lime if pH is too low. When planting mix Start n Grow or Garden-tone fertilizer in the soil. Fertilize your flowers once a month with a Bloom Special 2-10-10 or Flower-tone. Use Hortasorb so it will retain the moisture in the soil and then the plant requires less watering during our dry weather. Pruning can still be done at this time. Shape for easy harvesting. Choose ONE of the three ways: North/South first year, East/West second year or on Top third year. After pruning you can fertilizer your trees with Citrus Special 6-4-6 or Citrus Tone Fertilizer that is an organic fertilizer. Use 1# per foot of branch spread. Your trees should be sprayed to protect them from anthracnose with Liquid Copper. Also spray to protect them from Citrus Leaf Minor using Malathion and Oil or Conserve Naturalyte (Spinosad) once a week to protect the new growth. Do not spray if your tree is in full bloom or your blossoms will not form any fruit for next year. Spraying with Malathion will cause the blossoms to drop. Prevent Greening using a soil drench every 6 months with Imidacloprid. This kills the psyslid that carries this disease. Florida finds a species of thrips that attacks a wide variety of plants in Florida. Named – Chili Thrips Scirtothrips dorsalis. Plants such as: Roses, Citrus, Ficus Trees, Lorapetalum , Ornamental Sweet Potato Vine just to name a few. They can be controlled by using an organic chemical called Conserve Naturalyte that contains Spinosad, apply weekly. Or use a soil drench every 6 months to prevent new Chili thrips. Any flowers or new growth on the plant can be damaged. Remove and destroy them before insecticide treatment starts. March is the last month to apply Weed & Feed because it will be too hot later in April. Fertilizer can be applied at any time Turf Builder 16-2-8 or 100% Organic 6-6-6. In April check in your Bahia Lawn and look for Mole Crickets. These can be identified by mixing lemon scented dish detergent (2 tablespoons to the gallon) and saturating about a square foot of grass. This will make them come to the top for air. Arena Granular (Clothiandin) NEW PRODUCT lasts for two months!!! Is a broad spectrum turf insecticide. This is a really good product to use against mole crickets, grubs, chinch bugs and fire ants. Be sure to water in heavy at least a 1/2 inch of water after application. In St. Augustine grass look out for chinch bugs. The best way to find them in the turf is cut out a 12 inch square foot of sod, then with white paper or card board in place, turn grass square upside down and bounce 2 or 3 times. Remove turf and the chinch bugs will be left on the paper. Adults have silver on their backs and nymphs are small, reddish brown, size of a dot and will be moving on the paper. Treating with products such as: Bifen, Orthene, Cyfluthrin, Deltamethrin, Permethrin or Sevin in liquid or granules. If present re-apply in two weeks – to break up the life cycle. If not present applied every 4 – 6 weeks if needed then check again for chinch bugs, make sure you keep the lawn well watered. If you need to fertilize and control insects we have a combination called Delta-gard that you can use on your lawn. Use a Palm Fertilizer for a longer residual in our sandy soils. Use 1# fertilizer for each inch in diameter of the trunk. Example 5″ trunk use 5# of Palm Fertilizer. Treat the soil and fronds (foliage) with Chelated Palm Nutritional for the correction and prevention of yellowing and “frizzle top” of these trees. Spray Neutral Copper Fungicide, apply to the top of the fronds (foliage) if they look wilted or limp. This will prevent anthracnose and leaf spots that may occur. Asian Cycad Scale is still affecting the Sago Palms. Treatment for this scale is intense to get it under control. Ask for the brochure from the County Extension Office how to control scale. The last time to prune your rose bushes is in March. Remove all dead wood and clean out the middle of the plant to open up your rose plant to allow air circulation. After pruning, paint with orange shellac, pruning paint or white glue to seal your cut. With each cut make sure to dip your clippers in bleach water (2 tablespoons per gallon of water) to disinfect each cut you make. Then spray your plants with Liquid Copper to control diseases such as dieback that can occur when you trim your roses back. To re-establish your rose bushes after cutting apply –1 cup Limestone, 1 cup Milorganite, 1 cup Bone Meal and ¼ cup Rose Fertilizer or 1 cup Rose-tone & 1 cup Limestone around the branch spread. Continue to spray for insects and to prevent black spot and powdery mildew. REMEMBER that a fungicide is a preventative not a cure. Choose carefully which vegetables you want to plant. Plant the vegetables that you and your family like to eat. Do not plant too much of any one vegetable at one time as this makes for a feast and a famine. Choose a location that is at least six hours of sunlight. Check pH of your soil, this should be 5.8 to 6.3. Add dolomite lime if pH is too low. Soil preparation should be done 1 to 4 weeks before planting especially for nematodes and other soil insects that can seriously reduce the growth and yield of most vegetables by feeding in or on their roots if not treated. For nematodes mix in your soil prior to planting egg shells or shrimp shells. For other soil insects use Permethrin or Sevin granules mixed in the soil prior to planting. Also incorporate Organic Peat Humas or Planting Soil if the soil is sandy, to help hold the moisture and fertilizer for your crops. At the time of planting, use an organic fertilizer such as, Garden-tone, Milorganite or Black Kow. In Florida sandy soil, vegetables need a continuous program of feeding and watering. For monthly fertilizer use: Tomato-tone or Bloom Special 2-10-10 fertilizer for blooming vegetables. For insects that may get on your vegetables like aphids use permethrin. For ants or leaf minor use Conserve Naturalyte. For worms or caterpillars use: Thuricide, Dipel or Sevin. BULBS: AMARYLLIS, AMAZON LILY, BEGONIAS (TUBEROSE), BLOOD LILIES, CALADIUMS, CALLA LILIES, CANNAS, CRINUM LILY, DAHLIAS, DANCING GINGER LILY, ELEPHANT EARS, GLADIOLUS, GLORIOSA LILY, PINE CONE GINGER LILY, RAIN LILIES, UMBRELLA PLANT. FLOWERS (S=FULL SUN; SH=SHADE; SS=SEMI-SHADE): AGERATUM-S,SS; AMARANTHUS (SUMMER POINSETTIA)-S; ASTERS-S,SS; BABYS-BREATH-S,SS; BALSAM-S,SS; BEGONIAS-SS,SH; BROWELLIA-SS,SH; CELOSIA-S; CLEOME-S,SS; COSMOS-S; DAHLIA-S,SS; DALBURG DAISY-S; DELPHINIUM-S,SS; GAILLARDIA-S; GAZANIA DAISY-S; GERBERA DAISY-S; IMPATIENS-SH; LISIANTHUS-S,SS; LOBELIA -SS,SH; MARIGOLD-S; MELAMPODIUM-S; NICOTIANA (FLOWERING TOBACCO) S,SS; PERIWINKLE-S,SS; PHLOX-S; PORTULACA-S; PURSLANE-S; RUDBECKIA (BLACK-EYED SUSAN)-S; SALVIA-S,SS; STATICE-S; SUNFLOWERS-S; TORENIA (WISHBONE FLOWER) – SS,SH; VERBENA-S,SS; ZINNIAS – S.
HERBS: BASIL; CATNIP; CORIANDER(CILANTRO); CHIVES; DILL; FENNEL; LAVENDER; LEMON GRASS; MINTS; OREGANO; PARSLEY; PENNYROYAL; ROSEMARY; SAGE; SUMMER SAVORY; SWEET MARJORAM; TERRAGON; THYME. VEGETABLES: BEANS (LIMA ,POLE & SNAP); BROCCOLI; CABBAGE; CANTALOPE; CARROTS; CELERY; CORN; COLLARDS; CUCUMBER; EGGPLANT; MUSTARD; OKRA; PEAS(BLACK-EYED); PEPPERS; POTATOES(SWEET); RADISH; SPINACH; SUMMER SQUASH; TOMATO; TURNIPS; WATERMELON; ZUCCHINI SQUASH. Bring your plants, we will help you. © Copyright 2019 Peterson Nursery & Garden Center, Inc. All Rights Reserved.